Update: Turns out the screenshots referred to in this story are fake. They are fan made images, with a Weibo account as their source (though they have seemingly been taken down from there as well). So move on, there's nothing to see here. 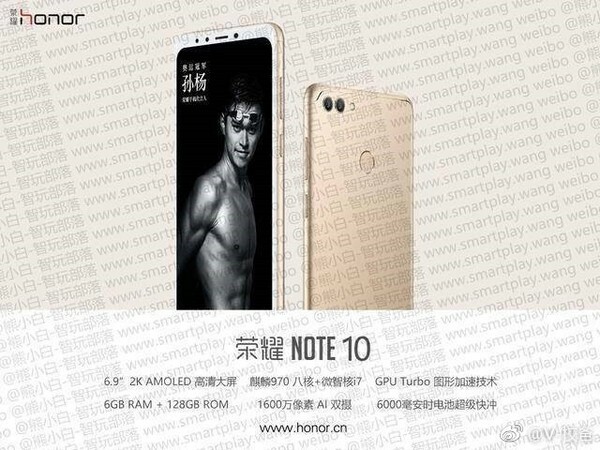 A couple of leaked images showing Huawei's Honor Note 10 smartphone have surfaced. The images - which seemingly are screenshots of the device's official page - not only reveal the phone's design, but several of its key specs as well. Design-wise, we see thin bezels, dual rear camera, and a fingerprint sensor on the back. While the front panel is in white, the rear one is colored in gold. As for specs, the second screenshot (see below) confirms the 6.9-inch display that has already been rumored. Further, the leak reveals 2K screen resolution (should be QHD as Chinese companies often mix those up), Kirin 970 SoC (which powers the Honor 10 as well), 6GB/128GB memory configuration, and 16MP main camera setup with AI capabilities. Among other key features, the leak says there'll be a mammoth 6,000mAh battery to keep the lights on. And finally, the device will also feature the company's GPU Turbo technology. There's currently no official information on when the Honor Note 10 will be available, although we expect the device may arrive towards the end of the year.